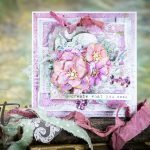 Today, I have the honor of showcasing one of the newest Spellbinders® dies, Blooming Collection. This die-template set has a little of everything: a beautiful frame, gorgeous and intricate filigree details and corners and it even has a template you can de-boss. This card might be a challenge, but I assure you, when following the instructions, it’s easier than it looks. Trim white cardstock to size 12″x6″ and fold to a card size 6″x6″. Trim pink cardstock to size 5¾”x5¾”. Glue upon card base using 3D foam squares. Trim patterned paper to size 5½”x5Â½”. Glue upon card using 3D foam squares. ”x3″. Glue onto the centre of the card base sing 3D foam squares. Cut/emboss Standard Squares Large #7 (with #1 being the smallest die-template) from pink cardstock. Use a sanding block to alter the embossed part by gently rubbing along the embossed parts. Glue upon cardbase. Stamp sentiment upon white cardstock. Die-cut the sentiment using Standard Circles Small #5. Glue die-cut to centre of the card base. Ink Blooming Collection #circle with pink ink. Die-cut/de-boss from white cardstock. Glue upon card using 3D foam square. Cut Blooming Collection #frame from white cardstock. Gently fold the die-cut frame diagonal around the white small square layer (curling some of the small filigree parts behind the white square). 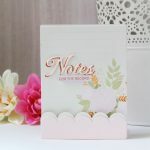 Cut Blooming Collection # coners 4 times from white cardstock. Glue to the card (curling some of the small filigree parts behind the patterend paper). 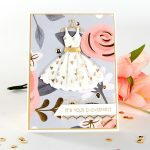 Finish the card with self-adhesive pearls and a satin bow. I hope you got challenged to try out this card. Looking forward to your (ever so appreciated) comments.